WHEN DETERMINING WHERE TO LIVE WHEN WE GET OLD, WE WILL MOVE TO OUR KIDS THAT ONLY HAVE 1 CHILD, NOT 3!!!!!! There…that was my lesson that I learned. After spending 5 days in Phoenix with these angels, I learned that I should have trained for a triathlon before attempting this challenge. I learned that I should have had a chiropractor on speed dial. Do not ever enter a restaurant without a bleach rag or antiseptic cleanser. I must have made 5 trips back to the silverware station for clean spoons after Noah kept knocking his onto the floor. NEVER LEAVE THE HOUSE without at least 3 pair of extra “big boy” underwear! Sometimes, the “big boy” forgets he is a big boy. Need I say more? All in all, I can’t even begin to tell you how many trips I made up and down the stairs. When I brought the boys their milk for the night, I was so proud that I had bathed them, had them brush their teeth, and they were actually in bed without one boo boo for the day. I handed them their milk and Caleb says to me, “Nana, you have the wong cups. Noah has to dwink his out of his baby cup and I don’t dwink out of this one, because it is a baby cup.” I told him to just exchange them and all would be right in the world. He looked at me and said, “Nana, Noah’s uses the cup that looks like a cow uddor (Caleb doesn’t seem to see the need to use “r’s” so we never hear a “r” in the Dupree household), but it only has 1 uddor on it” So I ran back down stairs to find the cup with the 1 “uddor” on it. (Are they really teaching 5 yr olds about cow udders in kindergarten now)?When I come back up, I bring two new cups of milk and promise God that when I turn 65, I will go to Africa to be a missionary, if I just don’t have to run back down the stairs again that night. Caleb tells me that I still got the wong cup for him, but he will use the one I bwought up. God is faithful! If I survive this week, I guess I will be preparing to learn how to live in Africa. I kind of feel like this past week was a great start for learning how to live in the wild. When I plopped into the chair in the airport, waiting for my flight to take me home, I sat there thinking about how old this week made me feel. Why couldn’t I keep up like I could 40 years ago? My aching muscles and swollen feet reminded me that I guess I truly am not as young as I like to think I am. But after a couple days of rest, I’m sure I will be just fine and ready to tackle the next big challenge. Upon arriving in Dallas, I walk off the plane, in my cute little wedge sandals, knowing that Randy will be waiting with open arms to welcome me home. Well, a few minutes after leaving the plane, I am walking so fast, that I hit a wet spot on the floor that has just been mopped. Whish…down I go right in the middle of Love Field terminal C. All the precious little 15 yr olds walking around me, come over to me and I hear people saying, “help her up, somebody, help the lady up.” I felt my face turn red and didn’t realize until I got up what I must have looked like, trying to get up by myself, having turned over on all 4’s and pushing my way to try to stand. It was a proud moment, I can assure you. But in the distance, there Randy stands, with a huge grin on his face. Was he that glad to see me or had he seen me fall? 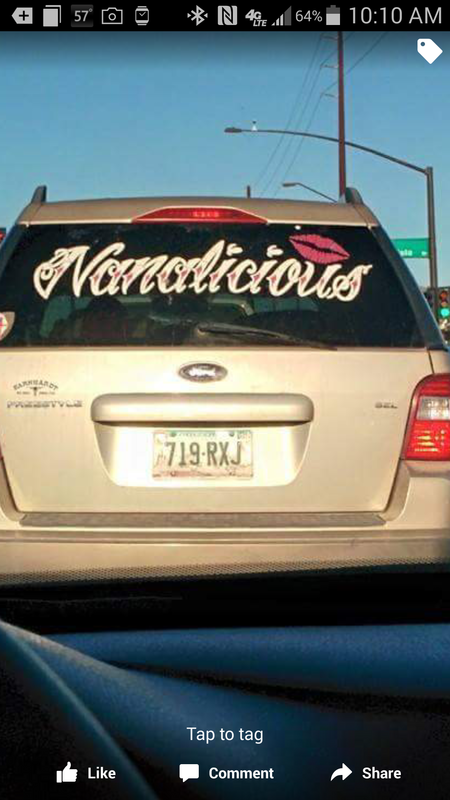 Could I feel any older than I had when the minivan that had dropped me off at the Phoenix airport was decaled with “nanlicious”? My dear sweet son-in-law thought it would be cute to have this on the van as I drove it around all week. Surely things will start to feel better as soon as I get to the house. Surely, as soon as I have a glass of sweet tea and sit down with my chocolate candy I had saved, I would begin to feel my youthful self again, well maybe after a good night’s rest. So settling down on the couch with my tea and chocolate, Randy brings me an envelop and says, “guess what you got while you were gone?” I glance down to see the giant envelop with giant letters forming the words “WELCOME TO MEDICARE”. I guess they think that we can’t see little letters unless they are the size of a large Vitamin. I think that the Nanalicious van doesn’t look so bad after all. At least it didn’t have a handicap sticker on the license plate and with 3 kids in the back I didn’t feel as old as I did right then sitting there with the Medicare papers to fill out. Wonder if the witch doctors in Africa take Medicare? After having 2 grandkids all last week-end…I can relate. I do think ours went better since ours are a little older (just don’t act it). I have had my Welcome to Medicare letter for almost 9 years…welcome to the club! !